QUESTION TIME | If you are voting BN/Umno in these elections, or if you are going to spoil your vote in protest over the miserable political situation, or if you are simply undecided who to vote for, or if you are merely looking for confirmation that voting against BN/Umno is the right thing, please read this article very closely. 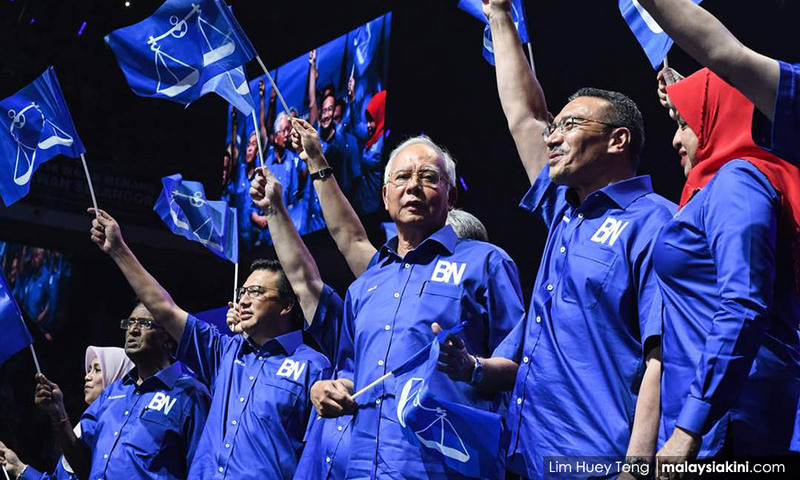 Here are my 10 reasons why I will not vote for BN/Umno and why I think it is imperative that we give another group a chance to run this country of ours before it is ruined completely by the incompetent, selfish, greedy, unconscionable, kleptocratic goons and gangsters who are running this country into the ground. If these people are allowed to run rampant with their ways for another five years, the damage to the country will be enormous and it could be decades before complete recovery is possible from the morass into which we are descending. And as they become more and more desperate, there is no telling what they will do in future. Press reports quoting the Auditor-General’s Report on 1MDB state that US$7 billion or about RM28 billion could not be accounted for, in other words, it has gone missing. The US Department of Justice (DOJ) says that it has established that at least US$4.5 billion has been stolen from 1MDB and it is in the process of seizing billions in assets bought with the stolen money, including that notorious yacht. It has been established that US$681 million came into caretaker prime minister Najib Abdul Razak’s accounts which he said was a donation from the Saudi Arabian royal family, part of which was since returned. But not according to the DOJ, which says it came from Tanore Finance which was controlled by Najib’s associate Jho Low. If you want to know full details you can download this report here, Part A of which I wrote. Look at Appendix 4 on page 34 to see where the money went. It is highly unlikely that the DOJ would have got its facts wrong because international money flows can be easily and accurately traced through electronic records which do not lie. If the caretaker PM is not complicit, he should have ordered an immediate investigation and brought those responsible to book. But it was not done. Now there are assets due to Malaysia in the US and other places but they can’t be returned because Malaysia does not acknowledge the alleged robbery. As educated people, other Umno and BN leaders must have been aware of all these but for various reasons, almost all of them have condoned Najib and continue to support him, becoming complicit in this massive kleptocracy, the biggest the world has ever seen. That’s itself is already more than enough reason to vote this whole gang out. Not only that, this unprecedented kleptocracy has enormous side effects in terms of lack of confidence in the country by both Malaysians and foreigners, which has led to a steady decline in the currency, although there is some recovery now. This reflects a kleptocracy premium for the currency. Compared to 1970, one US dollar now gets over 40 percent more ringgit. The fall in the ringgit value has caused large price increases. If you think kleptocracy was just a one-off event for elections in 2013 and it will not spill over to other areas, you are dead wrong. There is a hole in 1MDB and the alleged theft continued after 2013 and the only way it will not get exposed in future is if that hole is somehow filled. This may be done via lopsided contracts, expensive contracts whereby the excess can be syphoned off into 1MDB. One such example is the RM55 billion East Coast Rail Line (ECRL) to be undertaken by a China company – and the cost of which may balloon to RM100 billion eventually. An analysis shows that it is unlikely to be viable and at RM55 billion, it is already too expensive. There is delayed payment to the 90 percent financing, or RM46 billion for seven years after construction, which China is offering for this project. If the project is not viable, this becomes a huge burden of debt to future generations. This is not the only such project with China companies and there are several more in the pipeline. This may eventually take the full figure from these contracts to several hundred billion ringgit. If much of this is financed, then there will be massive debts facing future Malaysians. Such lopsided contracts are signs of desperation. Successful kleptocracy encourages more of the same and even more in future. So think Suharto, think Marcos, think how much damage they have caused to their countries and stop our kleptocrats from continuing to do more damage to us – now. They have inculcated a culture where politicians decide what is done, when, and how much to spend. Politics decide who becomes ministers, among whom there are now too many incompetent ones. There is no proper, independent study by the civil service on important matters and even if they are, they are routinely overruled. Only those who comply with the politicians move up the rungs, leading eventually to an incompetent and corrupt civil service as well. They have politicised the education system, first lowering standards for teachers and then for students and then de-emphasising English, which is a key language to acquire knowledge and ability because of its widespread use worldwide. They refuse to use English for teaching subjects such as science and maths, making most of the students in the national education system poor in English. This continues in university and results in the mass production of graduates who are unemployable because of low competence levels. Like all poor governments everywhere they use unfair, foul means to stay in power. Note the recent pushing through of the lopsided redelineation exercise which exacerbates already massive differences in constituency sizes against the stated aims of the constitution. Note also the hasty passing of the Anti-Fake News Bill designed to repress fair information on 1MDB and other scandals, with publication being stopped by a mere ex-parte court order. Since 1969, all BN/Umno governments have used the race and religion cards to garner support and this continues unabated now with frequent rousing speeches about Malay rights and defending Islam as if these were being attacked by non-Muslims, which are definitely not the case. Instead, even the caretaker deputy prime minister opposed a landmark decision by the Court of Appeal, which ruled that a child conceived out of wedlock can take on his or her father's surname and that the edict on this by the National Fatwa Committee does not have the force of law. The clear manifestation of corruption is people living way beyond their means. This is easily established by looking at the assets of people, especially those in high positions, and determining how they came to possess such assets, be it a yacht or a diamond necklace. But that line of investigation has never been implemented under BN/Umno. Politicians continue to amass vast fortunes with many having large cars, some kept in underground car parks, but no one is brought to account, except for opposition leaders and the so-called small fry. Some of them are not so small but very much so when compared to the size of the kleptocracy that is taking place. In September 2013, Najib announced a RM30 billion “bumiputera empowerment” programme, basically a series of contracts which will be given to bumiputera entrepreneurs. But will these contracts make a difference to the vast majority of 67 percent of bumiputera in the country? No. The people who will get them are those who are in Umno’s upper echelon, many of whom will act as mere middlemen and pass it on to others to implement, getting an upfront commission in the process. Select bumiputera - “the Umnoputera” - who are already rich get richer but the vast majority are left out. There are other methods they should have adopted a long time ago to help the bumiputera. But how could they when corruption and patronage, and now kleptocracy, got into the way? The claim that the government has eliminated poverty in the country is rather ridiculous when the poverty line income is defined as around an average RM800 a month per household, yes household, not even a person. What is more relevant is a living wage which Bank Negara Malaysia recently estimated at RM2,700 per month per person for Kuala Lumpur and RM6,500 per month for a household of two parents and two children. Using such measures, the indications are that the vast majority of the people may not have benefited much from government measures. That’s a poor performance for a resource-rich country like Malaysia. Stories have been rampant about Umno using thugs for a long time now but what surprised was an admission by a top Umno leader that there were “gangsters” he sided with. He not only defended Tiga Line, a gang outlawed by the police but included himself and others as part of the gang. He further condoned their actions and asked them to carry on. Democracy is about giving everyone an equal right to vote, to live the way he or she chooses so long as he or she harms no one else, freedom of expression, right of assembly and equal treatment under the law. But none of this is practised with a slew of legislation to deny the public their legitimate rights with even more legislation being contemplated, some in blatant violation of the constitution. The clear partiality of the enforcement agencies makes things much worse. Well, that’s my list of 10 although there is more. I ask that you take these into consideration before you put your cross for BN. Desperate people do desperate things. They must not be in power. Please think carefully about your future, for the future of your children depend upon it. In fact, it’s better if you give the opposition a chance. One question to ponder for those who think the opposition is the same as BN - have Penang and Selangor overall become better under the opposition? You know the answer, it's a definite “yes”. For those of you who will spoil your vote, what an utter waste of a precious privilege. What do you hope to achieve by squandering this? If you are so desperate and disappointed by the politics, at least consider giving someone else a chance to change things while they are in power. At least you would have exercised your constitutional right properly instead of playing into the hands of those in power who will rejoice because your vote won’t help to tip the balance. For those who will vote against BN/Umno, I hope this article girds your resolve more than ever and you will do your part about spreading the message as to why this government has to go. To everyone, do please go out and vote. Let nothing stop you from exercising your legitimate right. Make every vote count.